Also named the “Black Pearl of the Mediterranean Sea”, the “Daughter of the Winds”, Pantelleria is a dreamlike island come true. Visited by fashionistas and celebrities attracted by the kaleidoscopic combination of the green of vineyards, the striking red, purple, yellow of bougainvilleas, the blue of waters and the black of lava stone. The scenery displays rough lava stone and very small vineyards. It is just impossible not to surrender to its beauty. 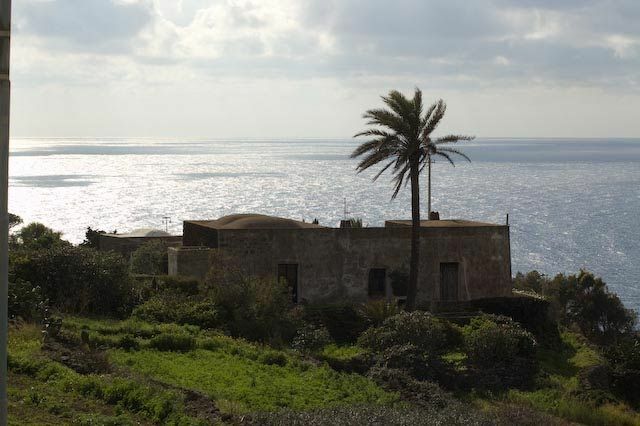 The Arabs, whose customs still are kept, came to the island in the 8th century it with a characteristic construction called dammusi (Picture 3) (a low accommodation built with thick volcanic rock) and also grew the zibibbo grape from which the moscato di passito di Pantelleria is made from. In Pantelleria town Castello Carabacane, set at the end of the harbour, is worth a visit. The town does not offer much as during the WWII it was destroyed and therefore had to be constructed again. But it adopted a new and different style with cube shaped houses. All villages on the island can be visited in a day trip. Main towns are Gadir (the most attractive), Rekale (in the south) and Scauri(a port). The island boasts a wide appeal when it comes to natural beauty. There are 24 ancient craters of red volcanic rock around Monte Grande, the main volcano on the island reaching 836 m at its peak lying in the centre of Pantelleria. At the summit of Monte Grande, the Stufa del Bagno di Arturo draws many visitors wishing to enjoy this natural boiling sauna and Specchio di Venere (Picture 1) offers a natural setting with volcanic mud. Bagno dell’Aqua is a bigger turquoise lake that can be reached more easily. The lake is visible from the village of Bugeber and in August its lakeshores are the setting for a horse race. The green Valle di Monastero and Valle di Ghirlanda offer a different geography away from vapour and heat. They are grown with vineyards. You can try hiking and riding in the valleys. Another interesting visit are the sesi, enormous Neolithic funeral stone piles where low passages take you to the centre. The island was full of these funeral cairns but as time went by the stones used for these constructions were reused in building dammusi. The dammusi resembles the sesi. Its walls are made from white-washed volcanic stone and the low cupolas maintain its interior fresh. For diving and snorkelling ‘s worshippers Pantelleria is paradise. Archaeological and night dives can be unforgettable experiences. There are many coves and sea grottos to enjoy the depths of these blue waters. In Gadir there is a wondrous hot spring. 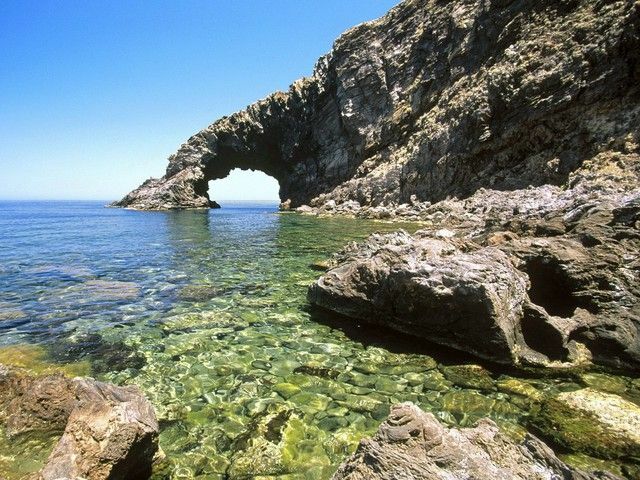 The grottos around the island can be visited on boat excursions. For entertainment Oxidiana is a renowned pizza parlours along with a swinging disco fully packed in the summertime. It was constructed from black lava providing it with a mysterious feel. Shopping is always tempting. The shops on the island stock mainly slips and sandals or its own variety of cosmetic products with the regenerating mud of Bagno dell’Aqua. La Nicchia stocks sweet wine, pickles and preserves. Habibi Club is in a typical dammuso, that needs reservation to find a place. It masters and exclusively serves the well-liked fish couscous. Il Cappero needs reserving and offers a pasta and fish menu. In Trattoria Favarotta you will savour delicious spaghetti con pesto pantesco, a sauce which contains tomato, garlic, pepper, and basil sauce) or roast hare among many other delights. Il Mulini is one of the top quality restaurants housed in a mill. You should try the baci, a delicious dessert of layers of pastry filled with ricotta. This large island makes it necessary to rent a means of transport if you wish to make the most of your stay. 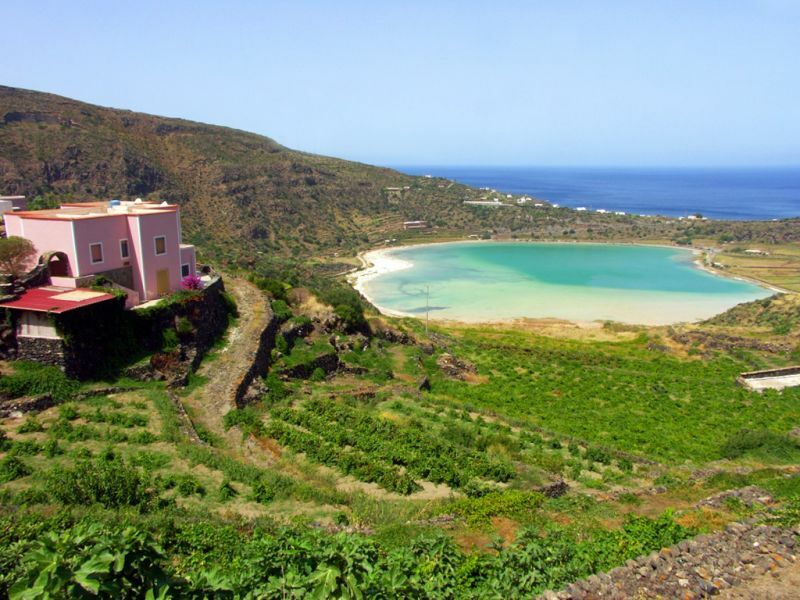 Pantelleria town is in the north west but most of the sightseeing is done on the southwest and northeast coast. BY BUS: from Palermo (length: 30 minutes ). There are also flights from Rome. There is a bus service to and from the airport. On the island there are buses servicing all the towns and villages which leave from Pantelleria town. BY HYDROFOILS: from Trapani (length: 2 ½ hours, services: 1 a day, June-September), from Trapani (length: 5 hours, services: 1 a day), from Mazara del Vallo (length: 2 ½ hours, services: 1 a day, June-September). From October to May services are less frequent and depend on the weather. MORE TIPS: car and scooter rental is a good option to discover the island first hand and independently.